Many Americans are skeptical that the advantages of economic globalization outweigh the disadvantages: 49% of the public said in an April survey that U.S. involvement in the global economy is bad because it lowers wages and costs jobs. That compares with 44% who said that global economic engagement is good because it opens new markets and creates opportunities for growth. 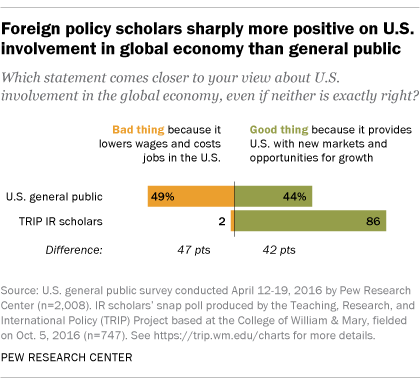 The U.S. public’s divided worldview sharply contrasts with the overwhelming opinion among international relations (IR) scholars that America’s involvement in the world economy is good for the nation. In the latest of a series of online “snap” polls that ask university-based IR experts their opinion about current policy issues, the Teaching, Research, and International Policy (TRIP) Project early this month found that nearly nine-in-ten IR scholars (86%) see U.S. involvement in the global economy as a positive; just 2% of those in the poll say it is a bad thing. Individuals selected for the TRIP survey must be employed at a political science department or professional school of a U.S. college or university and teach or conduct research on issues that cross international borders. The stark contrast between elite and public views of global economic engagement speaks to a larger divide in American society regarding the consequences of globalization. A Pew Research Center survey of members of the Council on Foreign Relations (CFR) conducted in fall 2013 showed that foreign policy experts have a “decidedly internationalist outlook” and “see benefits for the United States from possible effects of increased globalization, including more U.S. companies moving their operations overseas.” This includes more than nine-in-ten CFR members (96%) saying that it would mostly help the U.S. economy if more foreign companies set up operations in the U.S. (compared with 62% of the American public), and 73% thinking more U.S. companies moving overseas would be mostly beneficial for the economy (versus only 23% among the general public). Educational attainment matters a great deal in terms of how Americans assess the benefits and costs of global economic engagement. In the April survey, six-in-ten Americans with a postgraduate degree thought involvement in the global economy was a good thing. More than half of Americans with a college degree felt the same. But only 36% of those with a high school education or less agreed. On the political spectrum, liberals in the U.S. are more likely than conservatives to say that U.S. participation in the global economy is a good thing (50% among liberals vs. 40% among conservatives). There is also a bit of a divide by ideology among IR scholars, with self-described social liberals preferring economic involvement (88%) compared with socially conservative IR scholars (68%). Political and ideological differences, of course, have been evident in the current presidential campaign. Among registered voters, those who back Hillary Clinton are also more likely to support free trade agreements than are Donald Trump’s supporters. Here are details on the TRIP snap poll survey findings and detailed methodology.